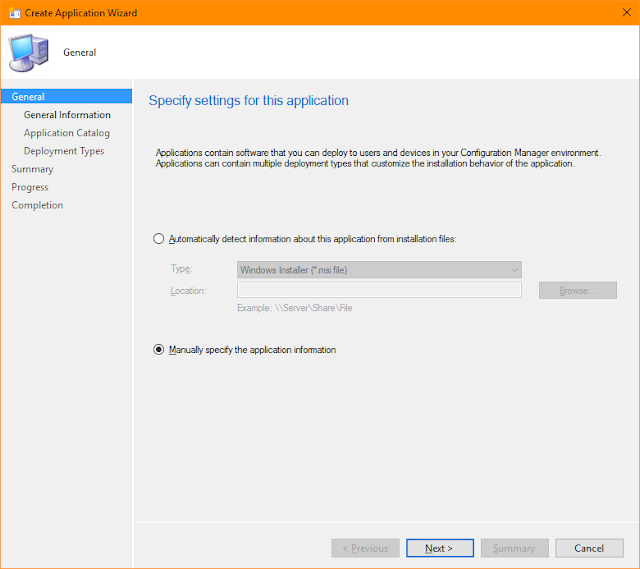 As a part of installing SCCM you must extend your AD schema. Below is the manual steps to do that. Create the System Management Container As a part of installing SCCM you need to create the System Management Container. Below is how you can do that manually. 12. 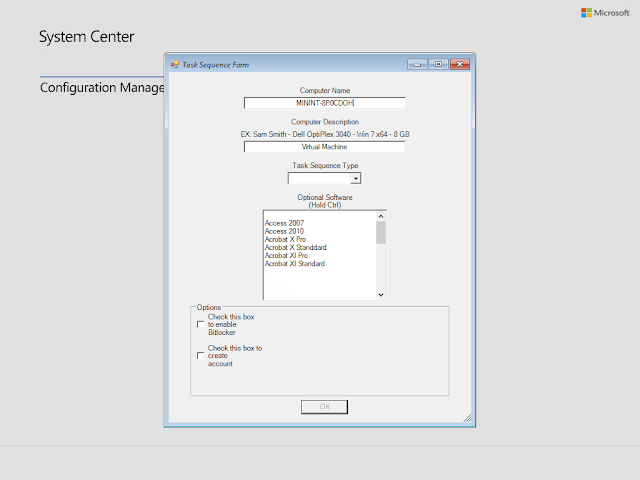 Add all servers you created for your SCCM environment and grant them full control. Sometimes you want to create a query based on if a computer has a specific Application and version number. This type of collection is great for bushing out an update to application. SMS_R_System.ResourceId where SMS_G_System_ADD_REMOVE_PROGRAMS.DisplayName like "Adobe Acrobat%"
The "9%" is the version, you can change this to anything that shows in the version column of add and remove programs. Sometimes you need to know what computer have not been rebooted in so many days. For example at my current employers out windows update do not force the computer to reboot after so many hours it is expected that each user to shutting down there computer each night. So I have used this query to see if that is actually happening. If you want to change the number of days that the computer has been rebooted in change the "2" at the end of the script to the number of days you want. 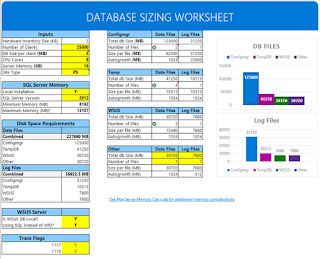 In my how to I reference a spread sheet that can help you to determine how much space you will need for SQL and to optimism your SCCM install. The sheet was created by Steve Thompson. Here is the original source for the worksheet but you do need an account to down load it. If you don't want to create an account I also have provided a link Here that you do not need an account to download. As I have said in the past SCCM is a beast there are a lot of moving parts needed to make the system work. When you plan on installing SCCM you should take some time and step back to look at how you want your system to be set up. 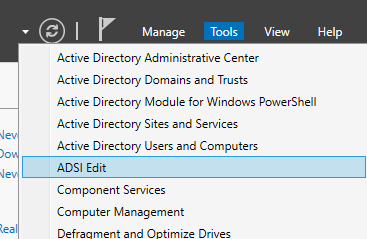 SCCM much like Active Directory can have multiple sub sites as apart of your primary site. In most cases you will only have a single site. An example of a user for multiple sites would be if you work at Food.inc and Food.inc owns Meat.inc, Veggie.inc and Grain.inc You could set up a Primary Site Server for Food.inc and a child Site server for each sub company. When you start to look at what hardware you are going to need you should be looking at Microsoft SCCM recommendations page. However since Microsoft doesn't always do a good job of always keeping information on there site I have a PDF version of the page saved. Below is a table right from the PDF that will help you to determine what you are going to need to set up your own site. Sometimes its hard to explain to other users how to add a device to a collection so I set up a script that will provide a GUI for a user to add a device to a collection. 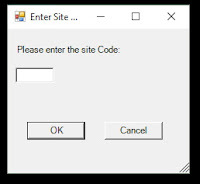 When you first run the script it will ask for the Site code if you don't want people to have to enter the site code each time they use the script comment out everything between # Begging of enter site code GUI and #end of enter site code GUI then where you see #sets the site variable to be used for the Set-Location command replace $site with your site code. NOTE: you must have access to the SCCM module location. If the sccm console is installed on the computer you are running the script from then there is nothing else you need to do. One challenge I have found with SCCM is how your organization views it. If you are taking a job as new administrator you may quickly find that expectations are very low. 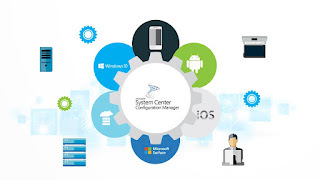 SCCM is a beast all of its own and by its nature can bevery difficult to maintain its very easy to mess everything up and not have it perform the tasks you want. If you came into an environment that was not well maintained or the previous administrator didn't know what they were doing then chances are people will hate SCCM. Most of these issues are primarily related to the organization is thinking of SCCM in the wrong light. In the past SCCM was known as SMS some administrators jokingly called it "Slow Moving Service". In some ways SCCM is still a "Slow Moving Service" that is all because in its roots SCCM is a tool meant to maintain compliance.